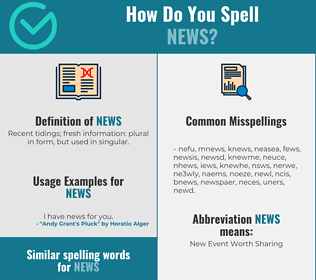 How Do You Spell NEWS? Correct spelling for the English word "news" is [njˈuːz], [njˈuːz], [n_j_ˈuː_z]] (IPA phonetic alphabet). Below is the list of 246 misspellings for the word "news". Recent tidings; fresh information: plural in form, but used in singular.